OMG! I found a way to stop ActiveSync from auto synchronizing every two minutes. 🙂 OK, I realize this post is somewhat off-topic from programming, but I just had to share it! If you’re a PocketPC, SmartPhone, or Windows Mobile developer, then I’m sure you are all too familiar with this problem. ActiveSync (otherwise known as Mobile Device Center on Vista) seems to synchronize every couple minutes whenever any mobile piece of hardware is constantly connected to your PC. This may be fine for those developers using the emulator, but if you need to test code changes directly on a specific device, you’re out of luck. The resource-hungry ActiveSync will make even a jog-wheel or D-pad super slow to respond. In my case, I can only test on the device itself since I’m doing graphical applications that need a back buffer (the emulator doesn’t support this). Open your Services list (Start->Control Panel->Administrative Tools->Services). One thing to note: Windows will automatically restart those two mobile device services after about five to ten minutes, or when debugging a mobile app in Visual Studio. But don’t worry, ActiveSync stays disabled. Double-click on Windows Mobile Device Center. Wait until this dialog says your device is connected. 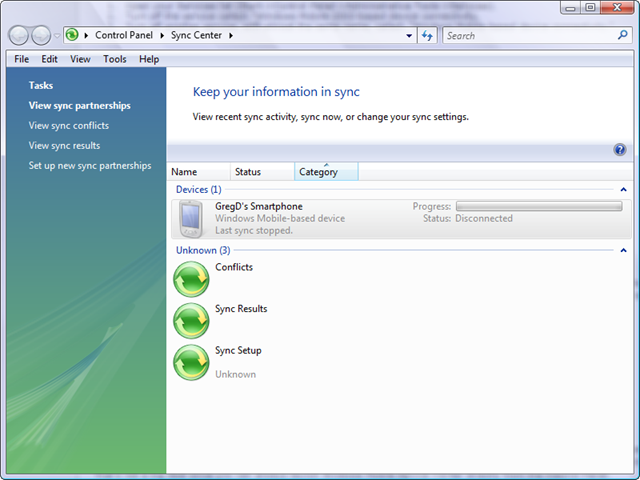 Important note: turning off those Windows Mobile services has one small non-critical side-effect: the Open Windows Mobile Device Center menu option inside the Sync Center dialog stops working. Nothing happens when you click on it. However, you will still be able to open Mobile Device Center from the Control Panel. http://micrologics.co.uk/library/ast/ – they have a free little application that claims to override ActiveSync giving you full control. I haven’t tried it but they list many positive testimonials. I’m curious whether either of the above two solutions work on XP. If you try either of them and they work, please leave a comment on this post. Thank you. This entry was posted on December 18, 2007 at 8:11 am	and is filed under Tips and Tricks. You can follow any responses to this entry through the RSS 2.0 feed. You can leave a response, or trackback from your own site. Good post. Thank you for this. Thanks for pointing me in the right direction to figure it out on Windows 7. In Windows, the path to get to it is different. While in Admin tools, double click “Component Services” and then click “Services”. Look for the “Windows Mobile-based device connectivity” and click it. Then you will want to click the “More Actions” to get to the “Properties” section. Once in there you will want to change the Startup type to Manual. Do the same to “Windows Mobile-2003-based device connectivity”. Also, make sure you turn off “Synchronize all PCs using this connection:” in the connection settings in Activesync on your phone. I forgot to do this and was still syncing after doing everything above.